Adding a new building to our collection of locations throughout Toronto is always a thrill, and this one is no exception. Recently launched, The Livmore captures all of the best aspects of life in urban Toronto. 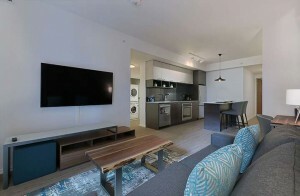 With a range of studio, one, two and three bedroom floor plans, these “refined residential rentals” have everything you need for a comfortable, convenient and chic stay in Toronto. The Livmore will cater to young professionals, business travelers and anyone who is seeking temporary housing in Toronto with a condominium lifestyle for stays of 30 nights or longer. The suites sizes range from 388 Sq. Ft (Studio) up to 1100 Sq. 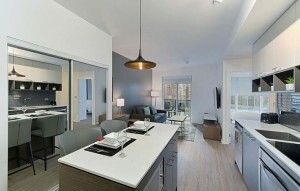 Ft (3-Bedroom) and are designed to let plenty of natural light in – creating a bright and spacious atmosphere. The building is designed with a range of high quality amenities – including a two-storey sky lounge on the 26th floor, an outdoor terrace with barbeques and fireplaces on the 5th floor and a gym and fitness area. Residents can admire the view, or stretch out and relax in the yoga and aerobics studio. The party room is a space ideal for hosting private functions – with kitchen facilities and plenty of space. There’s also a theatre/screening room and a game room (it’s hard to be bored during a stay here!). There are so many reasons why we are thrilled to announce this new building. First of all, there’s the location. It’s right on the corner of Bay & Gerrard in downtown Toronto, located in the heart of some of the city’s best nightlife, shopping and dining. You’ll be within walking distance from some of the best attractions in the city, including the Toronto Eaton Centre, Yonge Dundas Square and Toronto Hospitals. This is also a prime location for business travelers, as it is centrally located. Secondly, there’s the fact that the Livmore is pet friendly. So, if you travel with your furry friend you’ll be welcome here. There’s even an outdoor green space, known as the “Bark Park,” where dogs can come out and play. How great is that? Want to learn more about the building? Check out our Livmore page, or contact us with your questions – we are happy to help!